The mattresses in the ‘natural’ range are made of natural latex. The range contains mattresses with either 85% or 100% natural latex or 100 % FSC certified natural latex. Bedding products that contain at least 85% natural latex, are qualified as a ‘natural product’. For the production of its bedding components, Latexco uses natural latex sourced from rigorously selected and tightly regulated plantations. Mattresses with the FSC certificate are produced with materials from responsibly managed forests and provides full transparency and traceability throughout the whole process through control organisations like Rainforest Alliance. Natural latex offers several outstanding advantages. It feels very soft, giving you a pleasant, comfortable feeling. This material is very elastic and flexible. Consequently, a natural latex mattress helps the body when tossing and turning, while optimally supporting the body during sleep. Natural latex also ensures excellent ventilation, so that surplus moisture is easily discharged. Last but not least, research has shown that natural latex gives bacteria, fungi and house dust mite no chance. The comfort zones in the mattress, e.g. at the level of the sleeper’s shoulders and hips, can provide better support to the body. There are “natural” mattresses with single pin patterns and with five or seven zones. As an optional extra, we can also post-treat our mattresses to make them fire-retardant. These ‘natural’ mattress cores are made from a latex blend with 85% natural latex as a base. Mattress cores containing 100% natural latex offer outstanding sleeping comfort. Produced with materials form responsibly managed forests and provides full transparency and traceability throughout the whole process. 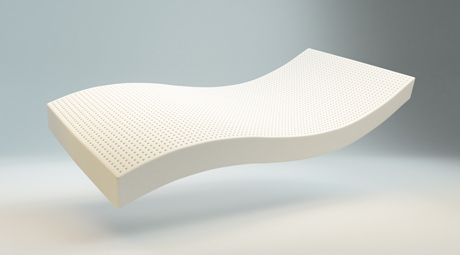 The Latexco ‘natural’ range comprises mattresses with 5 or 7 comfort zones, each of which supports a specific part of the body. We determined the exact positioning of the comfort zones in partnership with the renowned Institute of Ergonomics in Munich.